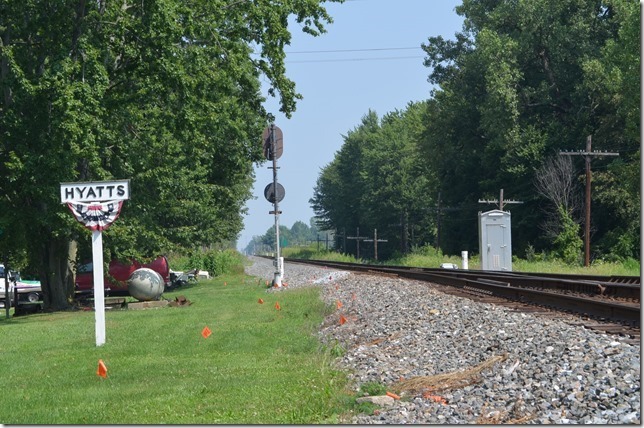 On Tuesday of the five-day C&O Historical Society Convention in Dublin, OH Herb Parsons and I decided to spend a few hours trackside on the former C&O main line north of Columbus. Our hotel was only a short distance from the track, so our first stop was Powell. 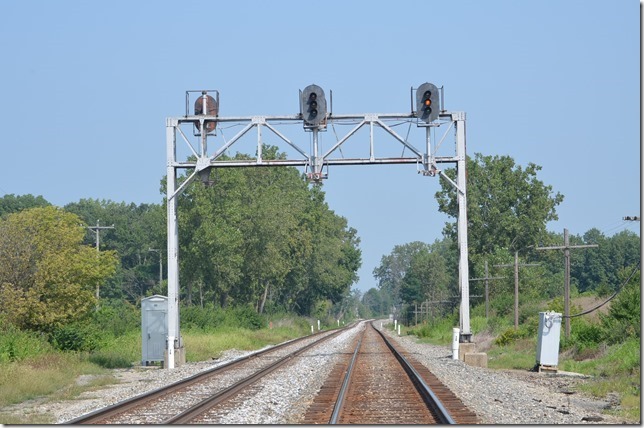 Coming out of the Scioto River valley in downtown Columbus, there is a 16-mile grade north (railroad west) the crests west of Powell. The hill reaches 0.50 percent in two locations. 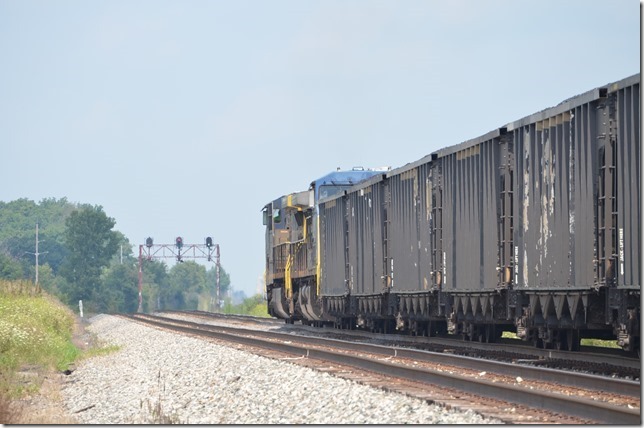 That is not very steep unless you are trying to get a heavy coal train up it. In steam days a helper was needed. In the ‘80s a pusher was used again, but now the powerful AC locomotives have tamed Powell hill. 17. K711 still in the block at signal 15.3. 18. I am told that the reverse curve looking west is the hang-up point. Powell Wye (MP 16.2) was just a short distance west, and that is where the steam helpers turned. 19. I am told that the reverse curve looking west is the hang-up point. View 2. 20. Looking west at Hyatts at MP 18.4. 3.5 miles of single track begin to Delaware. 21. Looking west at Hyatts at MP 18.4. View 2. 22. This is the first equilateral turnout I’ve ever seen on the former C&O. Good for 40 m.p.h. Sensing a lull in the action, Herb and I headed a few miles east to the NS Sandusky District at Lewis Center. 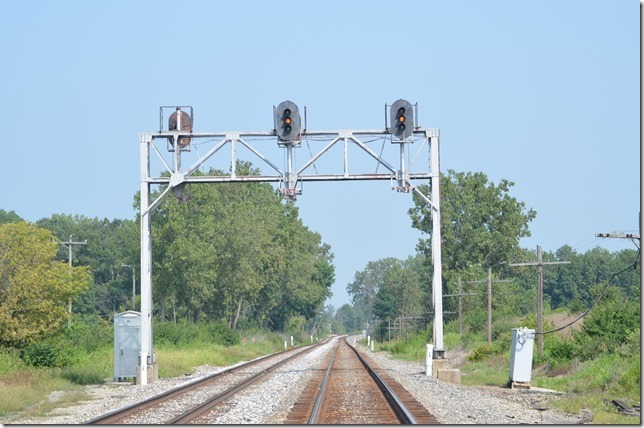 The crossing bell started ringing as we went across the track, and we didn’t have time to set up for this e/b intermodal train. 23. 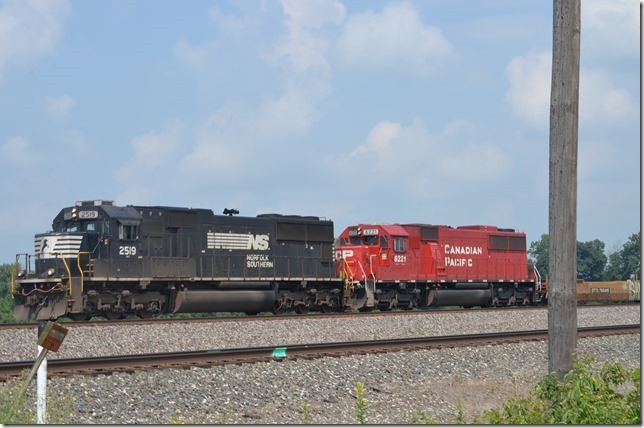 NS 2519-CP 6221 on e/b No. 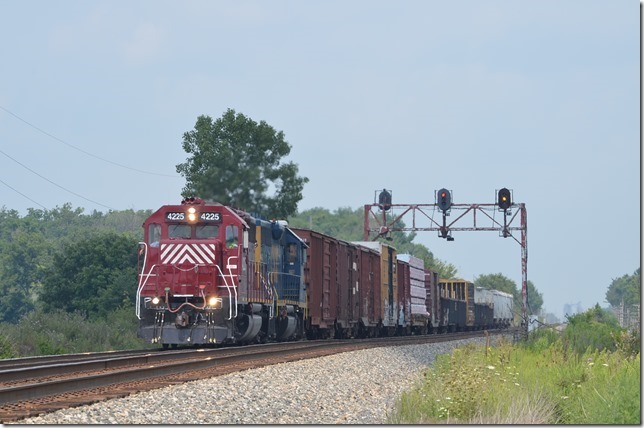 26N-18 (Chicago-Columbus, Rickenbacker Intermodal Term.) No. 26N has 41/18 vans of which 1 for Portsmouth, Va., 4 for Norfolk and 36/18 for Rickenbacker). 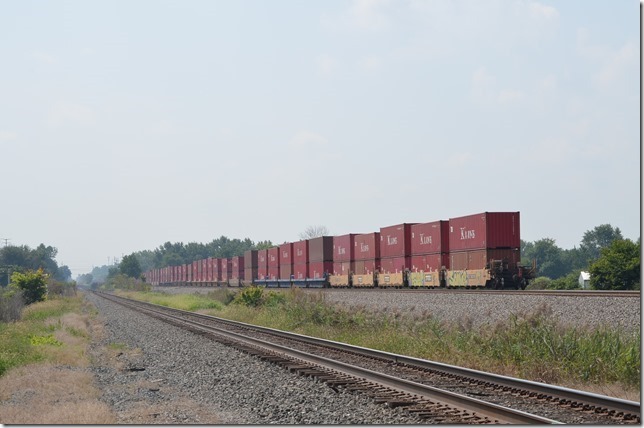 Rickenbacker Intermodal Terminal is south of Columbus at Lockborne with east access off US 23. 24. 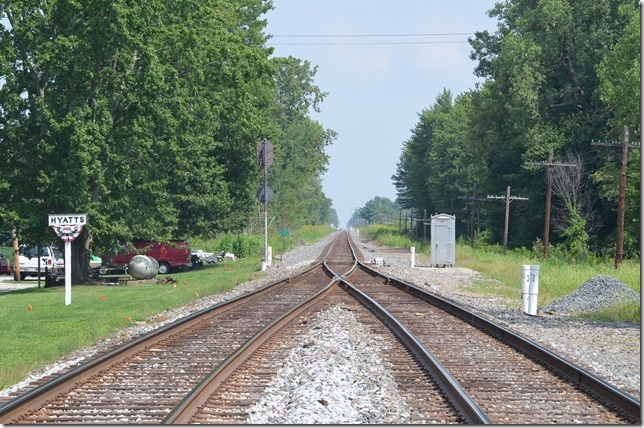 CSX Columbus Line (former CR, nee-NYC) is in foreground. 25. These were mostly K-Line with a few UPS containers. 26. 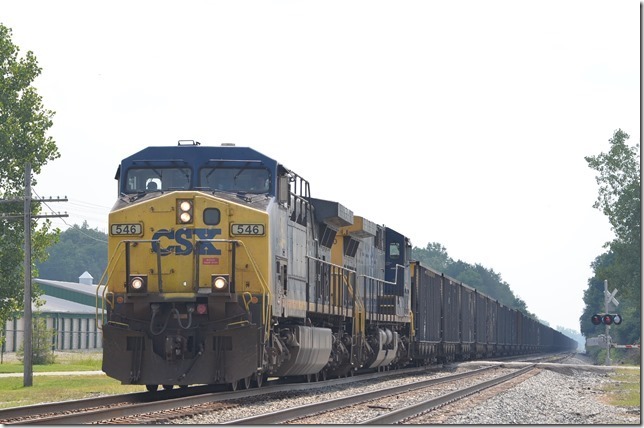 CSX 546-230 on w/b coal train N909-12 (Pardee, WV to West Olive, MI) with 99 FSTX (Fuel Supply Trust) loads. 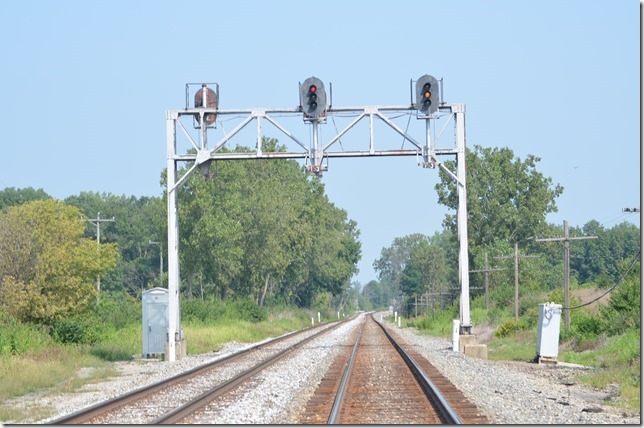 West Olive is near Grand Haven, MI on CSX. I suspect Fuel Supply Trust is affiliated with Consumer’s Power. This location is MP 27 which is north of Delaware. Down the track are the abutments of an abandoned interurban referred to in the C&O track charts as the “CD&M”. 27. 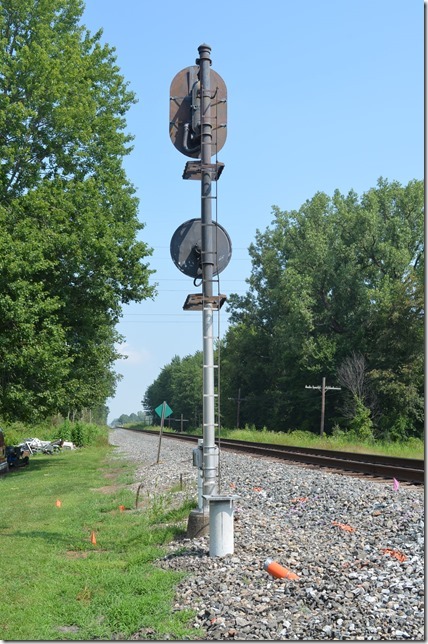 Clear on block signal 27.1. Receiving an approach signal, N909-12 was informed by the dispatcher that he would be meeting two eastbounds at Meredith. We walked up the track to get closer to the signal bridge. 28. 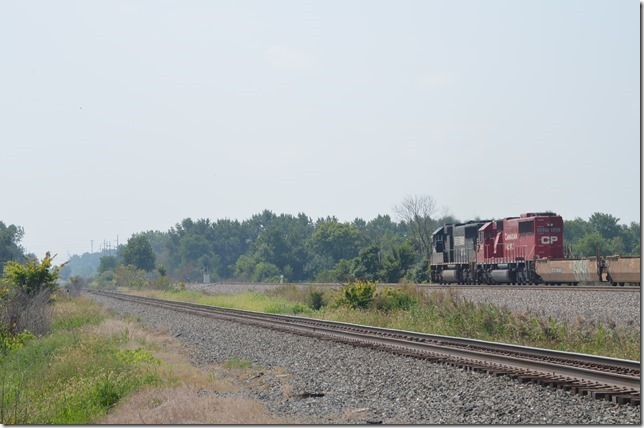 HLCX GP40 4225 and CSX GP40-2 6348 on e/b H792, a local operating between Columbus and Marion and return. 29. 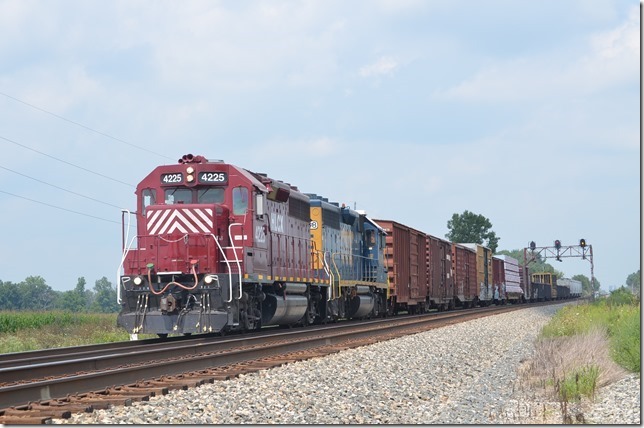 HLCX GP40 4225 and CSX GP40-2 6348 on e/b H792. View 2. Part 3 will complete the rail fan journey.